You will find the importance of a diamond grading report stressed across almost all of our educational pages, and with good reason. I refer to the Five C’s as ‘the mantra’ of diamond buying, with the fifth C, of course, standing for certification. A diamond grading report, often referred to as a Diamond Certificate, contains vital information about the specific characteristics and details for a particular diamond. However, not all diamond certificates were created equal; for buyers who want total assurance that their diamond is exactly as described on paper, only accept stones with certificates that have been issues by unbiased and internationally recognised gemmological laboratories. For the purpose of this article, I will be looking at certificates issued by the GIA but I also recommend AGS for their accurate and reliable diamond reports. If you are concerned by a particular grading report please get in touch with me directly. A diamond report issued by the GIA or AGS is essential, detailed and accurate, however the trend of shoppers misinterpreting or simply overlooking the information noted on the certificate rather defeats the point. 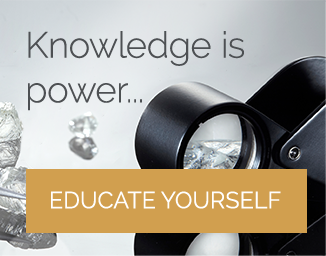 Developing an understanding of diamond certification will enable you to gain a deeper understanding of diamond characteristics and how this correlate to diamond price, ultimately leading to a smoother, more successful shopping experience. As mentioned, I will be using the GIA to explore the finer details of reading and understanding a diamond grading report. The GIA invented the system of grading diamonds with the 4C’s; the success of the system, with both diamond traders and consumers, resulted the majority of other gemmological institutes adopting similar versions of the GIA grading system. 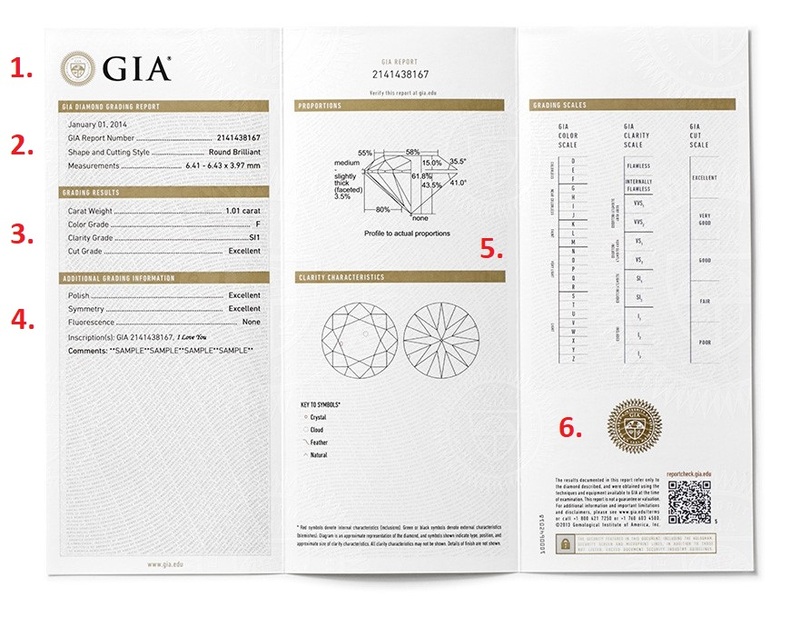 This not only sets the GIA as the benchmark for diamond grading, but the also means that being able to read a GIA report will leave you well equipped to read certificates from other organizations such as the AGS. For more information on the differences between the AGS and the GIA read my article on the subject here. Highly recognized in the industry and the leading authority in gemstone grading, you can buy a GIA certified diamond safe in the knowledge that it has been assessed accurately and graded under their stringent testing systems. I will be using this sample certificate from the GIA to give you a step by step guide to understanding your grading report. The report header will tell you who has actually graded the diamond. The better-known gem labs are the GIA, AGS, IGI, EGL and HRD. It is here that you may see a ‘speciality service’ report name. So, what do I mean by a speciality service report? Some diamond companies will offer their own grading reports which are completed by ‘independent’ appraisers or in-house gemmologists. These reports will often denote a high grade and good quality diamond for a ridiculously low price. Too good to be true? Absolutely. These notoriously cheap diamond deals are not deals at all, rather the certifications that they carry are the result of lax grading standards and the diamonds themselves are poor quality. These low-grade diamonds are not worth the fee that is incurred when a diamond is sent for grading; to overcome this, unethical jewelers will have the diamond ‘independently’ appraised or create a biased, in-house report in a bid to bump up the price. The result of this is a diamond certificate that is a complete mis-representation of the diamond it is attached to. Diamonds are not cheap. There is no such thing as a great ‘deal’ on a diamond, only a good price for a good quality diamond. Trust only the GIA and AGS to give you scientific and unbiased reports. 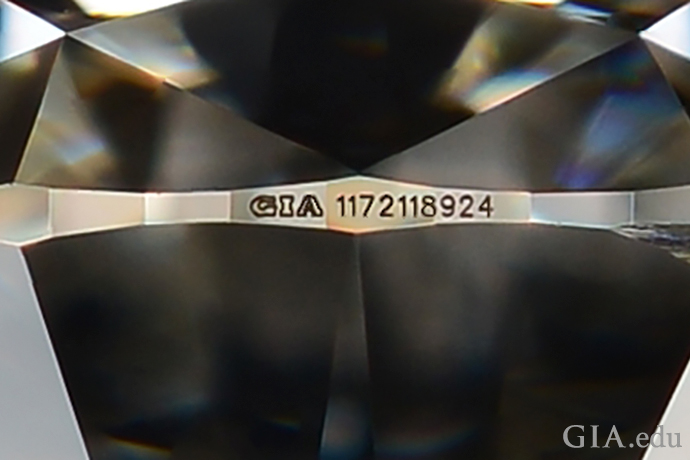 The report number is a unique series of numbers which allow your diamond to be recorded into the GIA database. This number is laser inscribed onto your diamond and although it cannot be seen with the naked eye, you might be able to make it out using a 10x or 20x magnification. This number is an important way of validating your stone. Should you ever lose your certificate this number means the GIA can issue a replacement. Perhaps most importantly of all, this number allows you to have direct verification of the report via the GIA website and database. The third section on your report will cover the grading results of the 4C’s. The first of these is the carat weight, which expresses the weight of the stone measured to the hundredth of a carat. Next, a color grade is given which is based on an assessment of the absence of color within the diamond. The color grades go from a D to Z and a separate grading system for fancy color is used if the diamond displays a color intensity that goes beyond a Z grade. The clarity grade is determined by an expert gemmologist who will examine the stone under a 10x magnification for any inclusions or blemishes (more on this shortly). If the diamond in question if a standard, 57 facets round brilliant, any reports dated after 2006 will also include a cut grade. This grade places the diamond on a scale of excellent to poor. The cut is the characteristic that will have the most impact on the overall brilliance and sparkle of the diamond, so it is vital that this grade is taken into consideration by the buyer. The additional grading information begins with a polish grading and a symmetry grading. These factors influence the finish of the diamond and affect and shape appeal and cut grading. The diamond polish is an indication of how smooth the surface of the diamond is; a smoother surface will produce sharp reflections and undistorted light transmissions. Symmetry is an assessment of the facets of the diamond and how aligned they are in relation to one another. Next you will see an assessment of the diamond’s fluorescence properties. Fluorescence is a visual feature that some diamonds possess which causes it to glow when exposed to UV light. The assessment is given based on the intensity and color that the diamond displays under the UV light (for example, None, Strong etc). This section then details the specific clarity characteristics. This is a closer look at the types of inclusions that are found within the stone. Finally, this section concludes with ‘other comments’ where any other miscellaneous information about the diamond can be noted. This can include laser inscriptions, identification details and any clarity characteristics that need further explanation. In this section of the report you will see two diagrams, one detailing the proportions of the diamond and the other identifying inclusions and blemishes. The proportions diagram shows a profile view of the stone with the critical proportions marked accordingly. This diagram includes: table %, depth %, crown angles, pavilion angles and girdle thickness. This section of the certificate is particularly useful to those looking into the finer details of diamond buying and looking for a stone that falls within the ‘ideal’ proportion parameters. Below the proportions diagram is a clarity plot diagram. This marks the positioning of external blemishes (marked in red) and internal inclusions (marked in green). If you wish to see the birthmarks of your diamond under a jewelers loupe, an inclusion plot diagram can make it easier to locate the unique marks that your diamond possesses. Finally, you will see some security features that give your certificate provenance and validate its authenticity. This usually come in the form of a hologram, a universal product code or an embossed stamp. The GIA provide an online verification service where you can instantly check your certificate and have it verified against their database. If you are able to read a GIA certificate, you will notice many similarities when looking at an AGS report. The main difference is the grading scales which can be seen in the lower half of the certificate. The AGS cut grade scale begins with 0 (an AGS Ideal) and moves down to 10 (poor). The certificate gives the full grade scale from 0-10 and includes the various quality points (e.g. AGS Good, AGS Fair etc). The overall diamond cut grade is found in section 1. of the certificate as well as individual grades for light performance, polish and symmetry. The AGS color grades start with a 0.0 (colorless) and move down to 10.0. 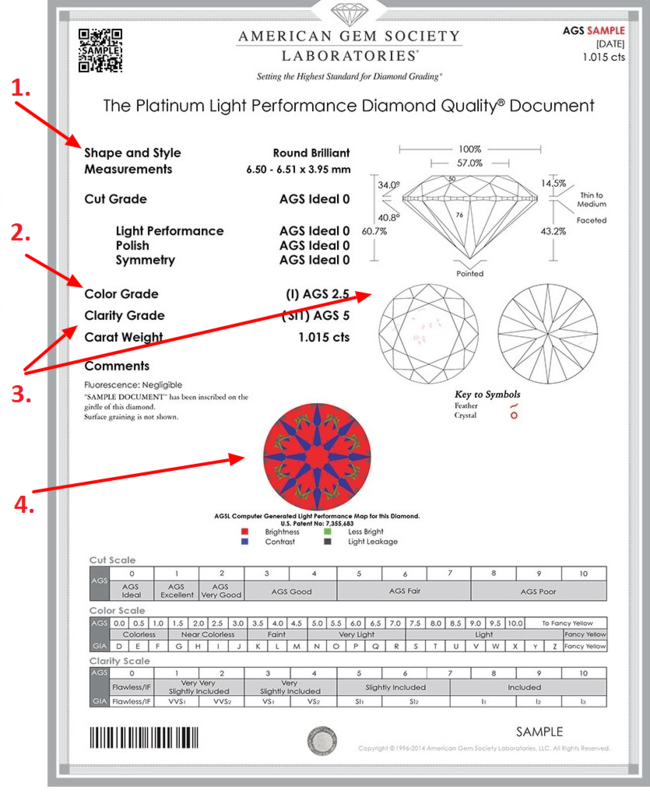 You will notice that below the AGS grade scale is the GIA color grade scale allowing you to make direct comparisons between a GIA and AGS diamond. For those who are more familiar with a GIA color scale, it is also a helpful point of reference and enables the AGS scale to be read with some perspective. The color grade is given in section 2. of the certificate. Like the cut and color grades, the AGS color grade scale begins with a 0 (internally flawless) and moves down to a 10. The GIA clarity grades run below the AGS scale on the certificate to allow for comparison. The clarity grade can be found in section 3. of the diamond report, with a diagram of the diamond clarity characteristics which are also known as inclusions. For example this SI1 Clarity Diamond is based upon the presence of a few feathers and crystals which are indicated by the red marks on table facet. The rest of the report follows GIA suit, with reference diagrams for proportions and clarity, shape and style and carat weight. It gives a reliable and accurates grading and provides six security measures to ensure authetnticity. Lastly the round and colorful image (4.) in the middle of the document is an Angular Spectrum Evaluation Technology (ASET) which the American Gem Society Laboratory uses to measure the brightness of the diamond and determine how it is making use of the light which is available to it. 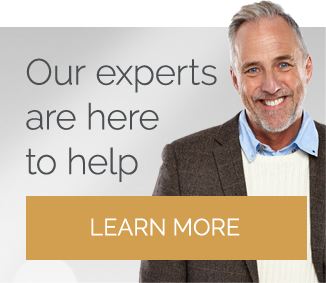 You can learn more about ASETs and other diamond imaging and videos here. 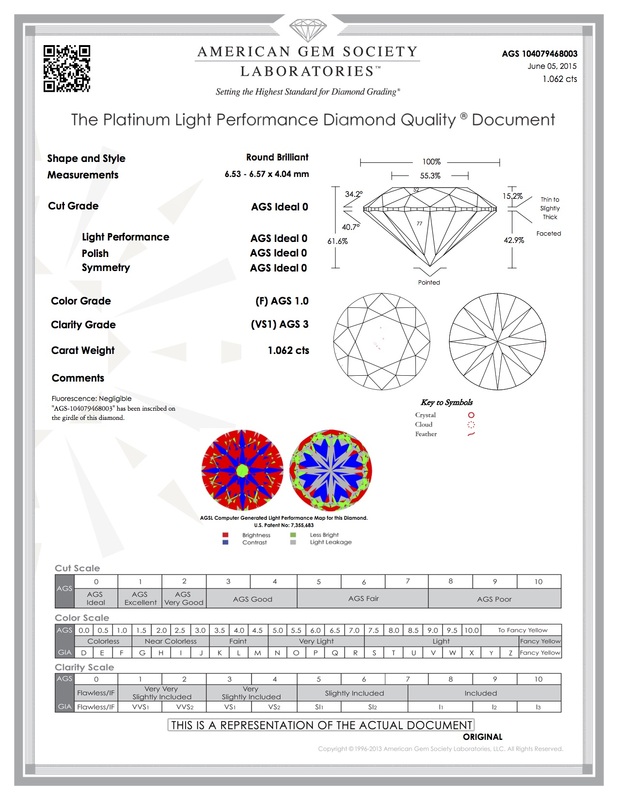 The AGS also provide Dual ASET Grading Reports - I would recommend getting one of these over the single ASET as it shows both table and pavilion ASET views of the diamond. Dual light maps will be most commonly seen on high precision diamonds to demonstrate hearts and arrows patterning, in addition to overall face-up light performance. In addition to being able to read an AGS Report it’s important to be able to verify it. AGS have produced The Six Steps Towards a Secure AGS Laboratories Diamond Grading Report which I highly recommend reading, if you are ever in doubt however please contact me directly for help or attempt to verify your AGS Lab Report here. I am consistent in my emphasis upon the importance of diamond certification, but this reminder should perhaps come with an additional mention of understanding the certification. 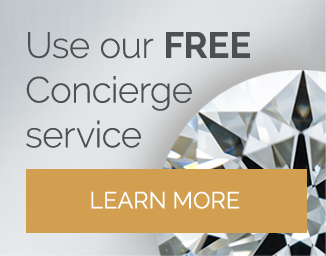 Like any form of paperwork, your diamond certificate contains vital information that will assist you both during your search and after your purchase. If you’re looking to purchase GIA certified diamond I would recommend James Allen or Blue Nile, if you're looking for the highest quality AGS Certified Diamonds then head to Whiteflash, their A CUT ABOVE® diamonds are in my opinion the best of the best.